If you are on a paleo diet, a low carbohydrate program or just trying to reduce your sugars but still want a crunch this cracker is for you . I find that it saves me from wanting a cracker, a chip or another crunch. 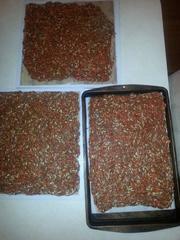 These crackers are made with flax seeds, sunflower seeds and veggies. 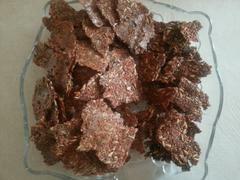 I have always made them in my dehydrator. I have an Excalibur dehydrator and love how my crackers and kale chips come out in it. 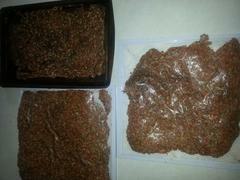 I was asked to test this recipe in the oven for those that do not have a dehydrator and they came out ok. I like the taste and crunch a little better of those dehydrated but its a good option for those who don't have one. When they are done soaking you will notice that the bowl is filled with a globby substance. This keeps your crackers together. 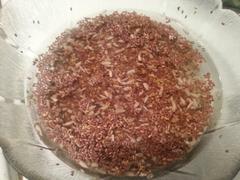 When you soak flax seed the phytic acid that is on the seeds is released and this allows you to get the good nutrition out of the seeds. Note: when you heat flax seeds you will lose some of this so if you are cooking these crackers use the absolute lowest setting on your oven, mine went to 175 degrees. If you are using your oven, make your oven as low as you can, mine wouldn't work at lower than 175 degrees. I left them there for 3 hours then turned it over pulled off the parchment paper and left another hour. They weren't as crunchy as i would like them but i was going to sleep so I turned off the oven and then turned it on this morning and let it cook for another few hours. IF I had started it earlier in the day I think that 5 hours on first side, turn over and then another hour or 2 would be great. Try it and post below what you find. I love putting a slice of avocado on them, or some guacamole, if I'm eating some chicken salad, hummus or anything I would use a chip or cracker for. I like to say that these crackers keep me sane in my not so sane food plan. Enjoy them. I'd love to hear how you like them or any questions you might have.